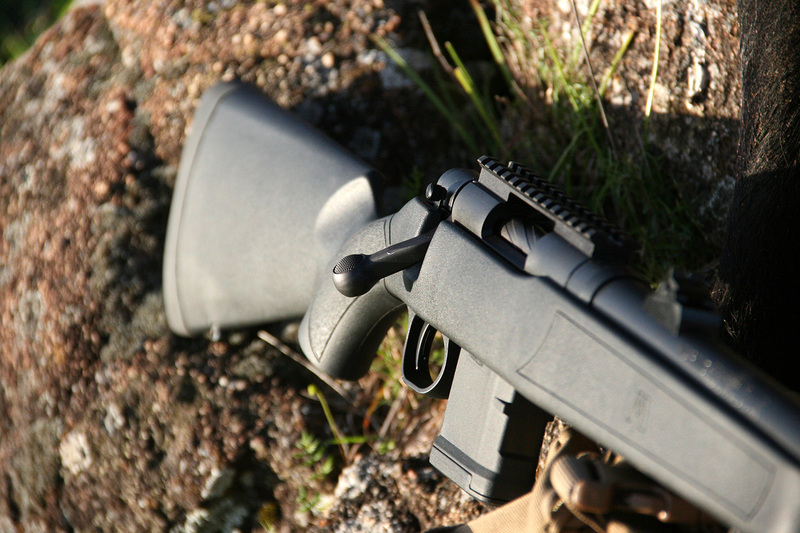 The scout rifles have been a hit with many shooters in the past decade due to their compact design allowing them to be carried on quad bikes and into more rugged terrain without getting caught up on the vegetation. The scout concept was heavily influenced in the early to mid-1980’s by Jeff Cooper (US Marine, Instructor & Writer) describing his ideal of a general-purpose rifle, “…a short, light, handy, versatile, utility rifle”, which Cooper dubbed a “scout rifle”. 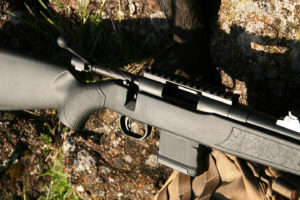 This was a bolt-action carbine chambered in .30 caliber (7.62 mm), less than 1 meter in length, less than 3 kilograms in weight, with Iron sights, a forward mounted optical sight (long eye relief scope), and fitted with a practical sling (such as ching sling). 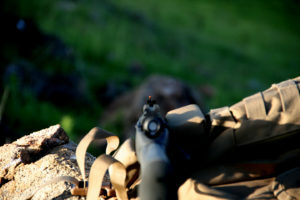 Cooper defined his goal: “… a general-purpose rifle is a conveniently portable, individually operated firearm, capable of striking a single decisive blow, on a live target of up to 200 kilos in weight, at any distance at which the operator can shoot with the precision necessary to place a shot in a vital area of the target”. 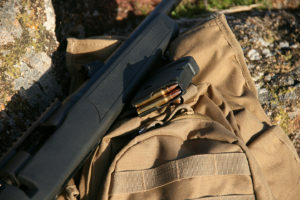 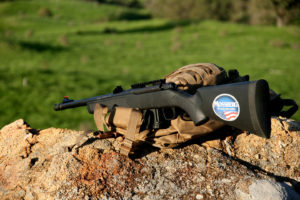 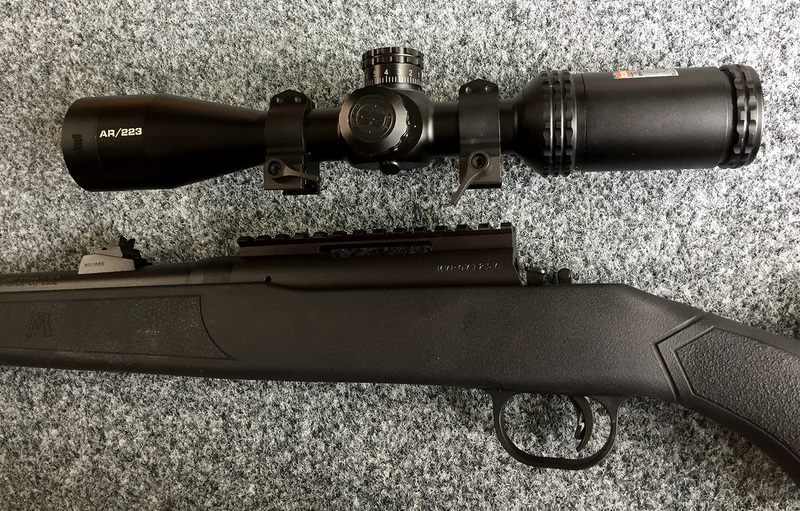 While the scout was inspired around a.30 cal round in recent years we have seen more manufacturers producing scout rifles in various other calibers and notably .223rem which brings us to look at the Mossberg MVP Patrol a rifle that feels great in the shoulder with extreme durability. Straight out of the box the MVP is ready to roll with its iron sights allowing fast reactive shooting essential when hunting thick scrub or tight creek beds, and with the supplied 10 shot Magpul polymer mag means you can readily deliver fast follow up shots should you come across a large mob of pigs. Because of the short 16″ bull barrel, the MVP features a flash suppressor to reduce the chances that the hunter could be affected by a flash from any unburnt powder in low light conditions and also reduce the effect of flash should a scout be mounted to this rifle. 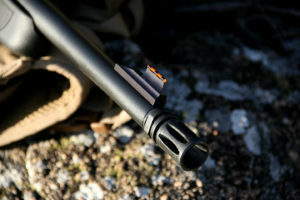 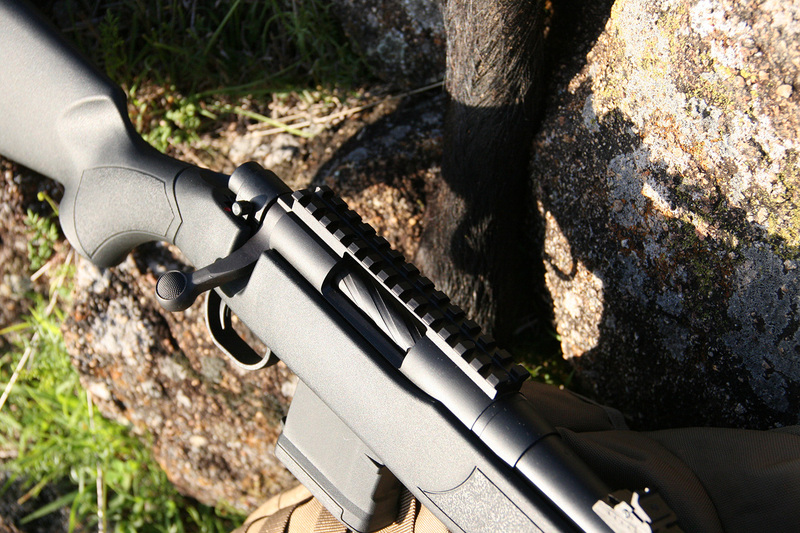 The 16″ barrel does pack a pack a noise punch so we would recommend hearing protection during long periods of use. 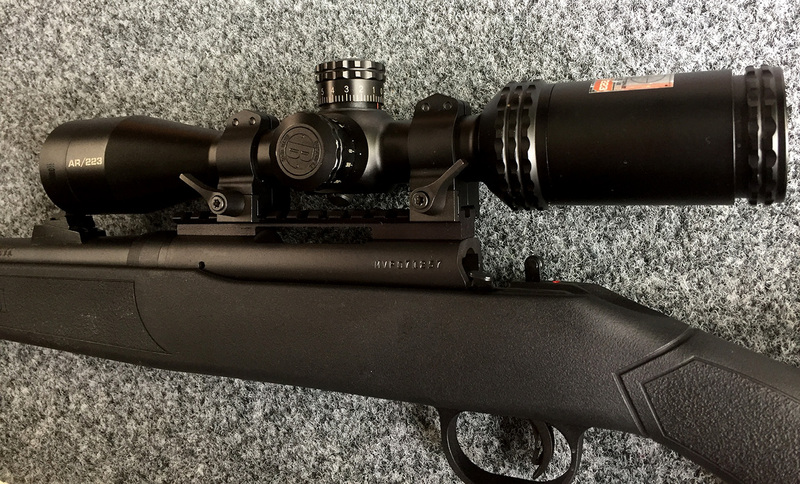 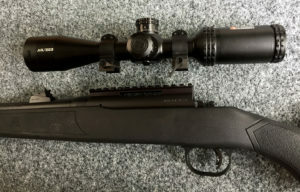 On top of the receiver there is a Picatinny rail to allow the mounting of a riflescope, for this review we mounted a Bushnell AR223 tactical 3-10×40 on Warne detachable rings for an accuracy test then removed it again to test its capability as an iron sight rifle. 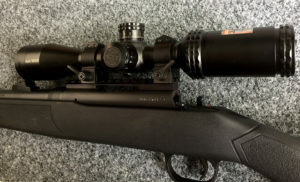 The Warne detachable scope rings allow the scope to be released in seconds if your hunting conditions change, although the 3 power was low enough for most shooting it was still good fun testing out the skills with the iron sights. 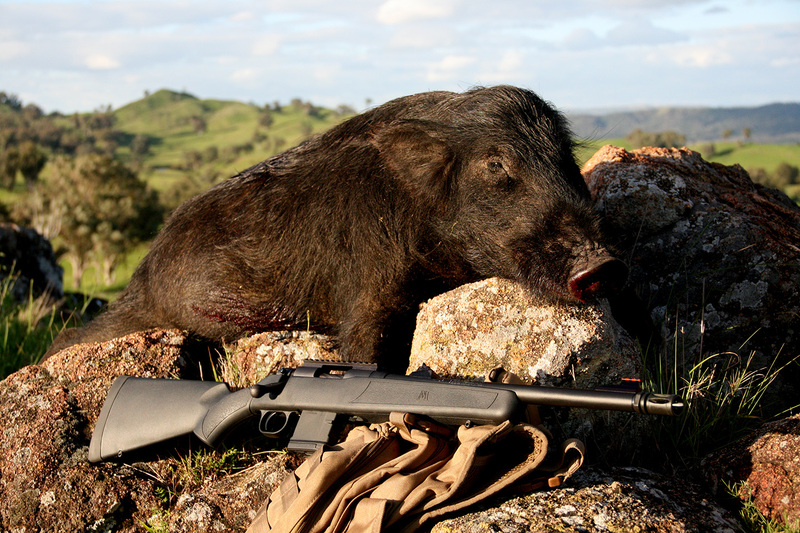 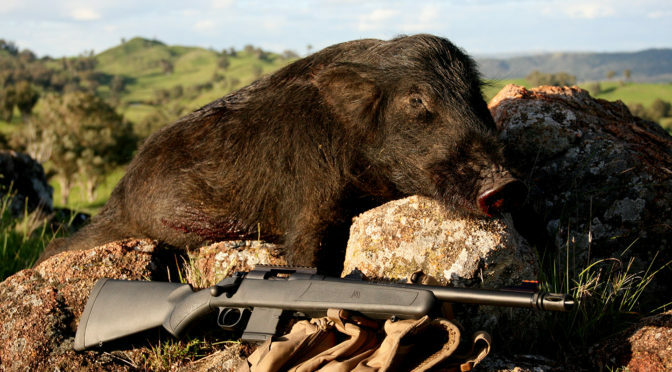 The accuracy of the MVP was impressive with its 1:9 twist bull barrel, after spending the morning running the barrel in we headed over to the dam wall to see how the rifle performed at a range of 120m. 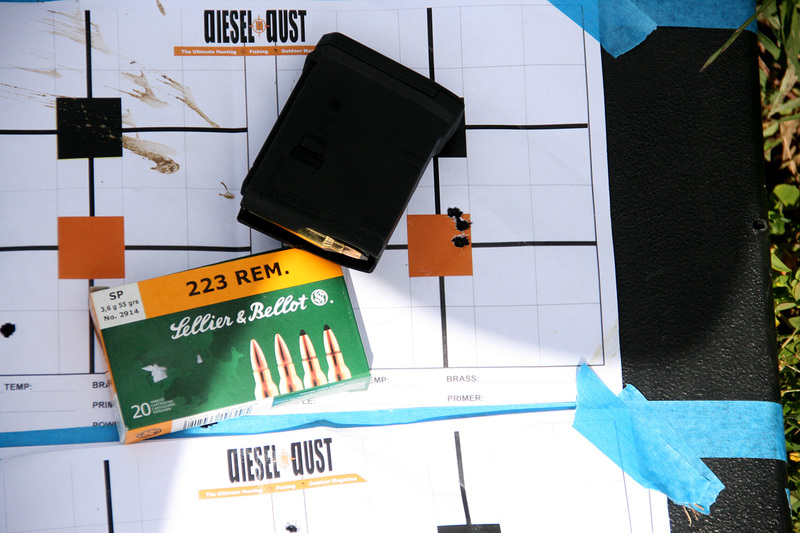 Using Sellier Bellot 55gr we were able to produce this 1″ group with a moderate right-hand cross wind. All MVP series rifles are fitted with the LBA adjustable trigger system which is user-adjusted and ranges from 3-7lb. After using the MVP over 4 days I found it to be a very handy rifle, was very easy to have on the front of the bike and didn’t get caught up as we traveled through the scrub. I walked a few creeks and found the MVP at times a little front heavy with the bull barrel but otherwise peformed well and put hogs on the deck!